This week I sewed and didn’t buy, so that’s good news for stash reduction. The Cool Colored twin quilt took 9.5 yards. Complete the second clue for Charlotte’s Scrappy Stars Around the Corner. Yes! 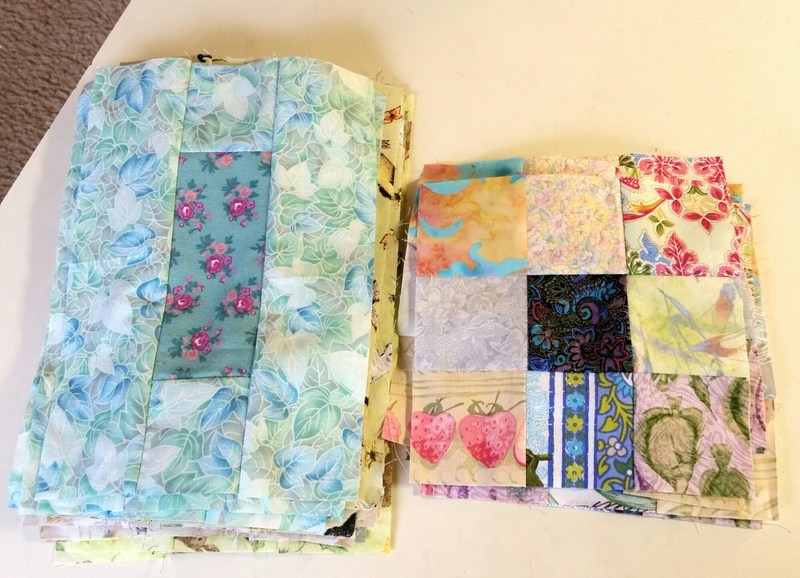 Continue Gyleen’s Bricks, Cobblestones, and Pebbles mystery quilt. Yes! Unpack fabric lockers and get help moving them over a foot. This will help with locker and floor access and make it easier to vacuum. Well, no. I did unload the lockers and attempt to move them, but they’re heavy and on carpet, so I gave up. Instead, I moved a lamp in the way, and the roll of batting. I also tidied up my cords, and changed the sewing machine so it wasn’t plugged into the same outlet as my iron (bad for the computer). And I vacuumed and dusted. Find a new home for the little project bins that live under the cutting table. Yes! There is clear floor space there. Make donation blocks for Kat’s February Challenge. Yes! Make a quilt for my Etsy shop. Yes, I made three! 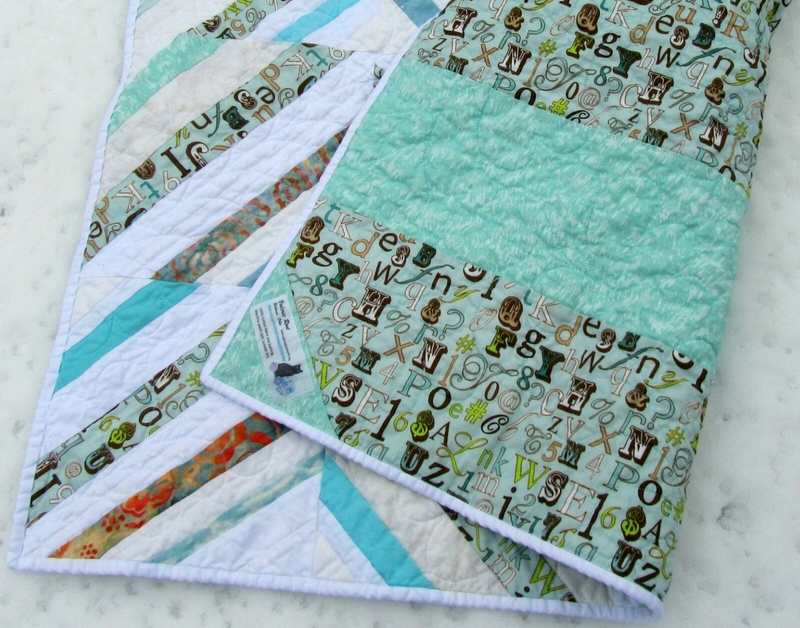 Bonus: I made a blue and green twin quilt to keep at home. Complete the third clue for Charlotte’s Scrappy Stars Around the Corner. Make a back and donate it with the top from Gyleen’s Bricks, Cobblestones, and Pebbles mystery quilt. Clear the area behind the door in my studio. Make donation blocks for Kat’s March Drive. Make some summer-themed wall hangings. Participate in Darla’s March-A-Long, where we sew a little every day. So February was a good month for goals, but it usually is. 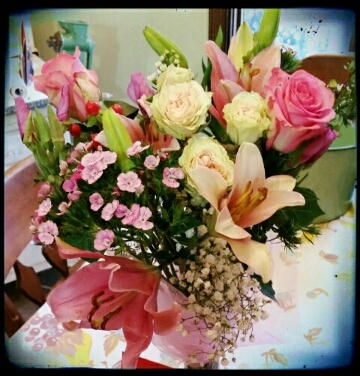 As we creep toward spring, outside work and other activities call, and I sew a little less. Luckily, Darla has her March-A-Long this month to encourage us to sew/prep for at least a few minutes every day, and that helps keep me going. Hope you join in, too. Good luck with your goals! I’m linking up to Judy’s report at Patchwork Times. Categories: Stash, Uncategorized | Tags: Evening in the Garden, goals, Valerie Root | Permalink. Yuri and I finished up this rail fence quilt yesterday. 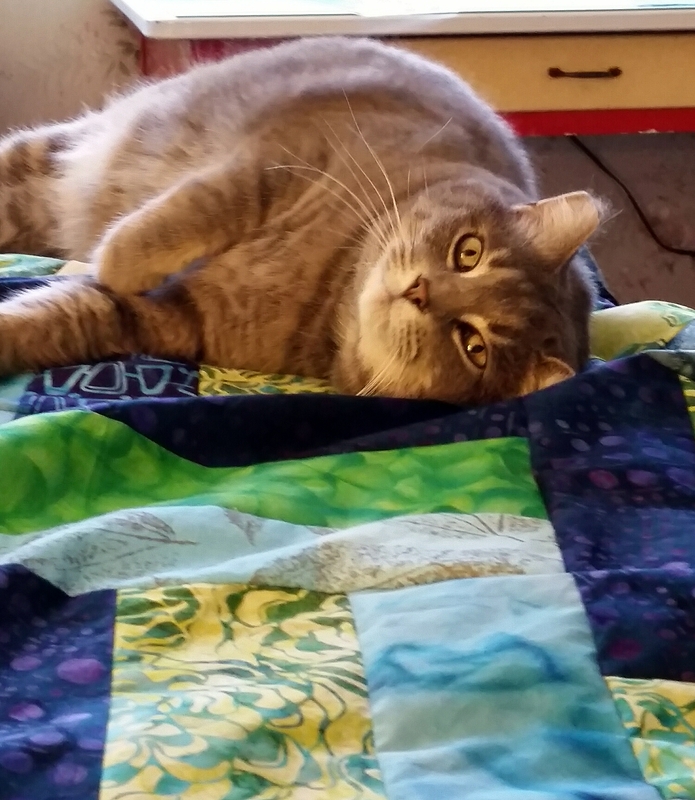 Here he is admiring some of our wavy quilting lines. And this is what the whole thing looks like. It’s 63″ x 81″, and the rail blocks are nine inches square. It’s all from stash, and the colors were completely inspired by this backing fabric I had on hand. I sort of quilted this backwards. Visually, I wanted minimal quilting, so I started out using the walking foot for a serpentine stitch in variegated thread down each bar of fabric. Then I decided that it needed more quilting to withstand use on a bed, so I went back and quilted in all the ditches with invisible thread. It made it a little wonky, but the result is fine. 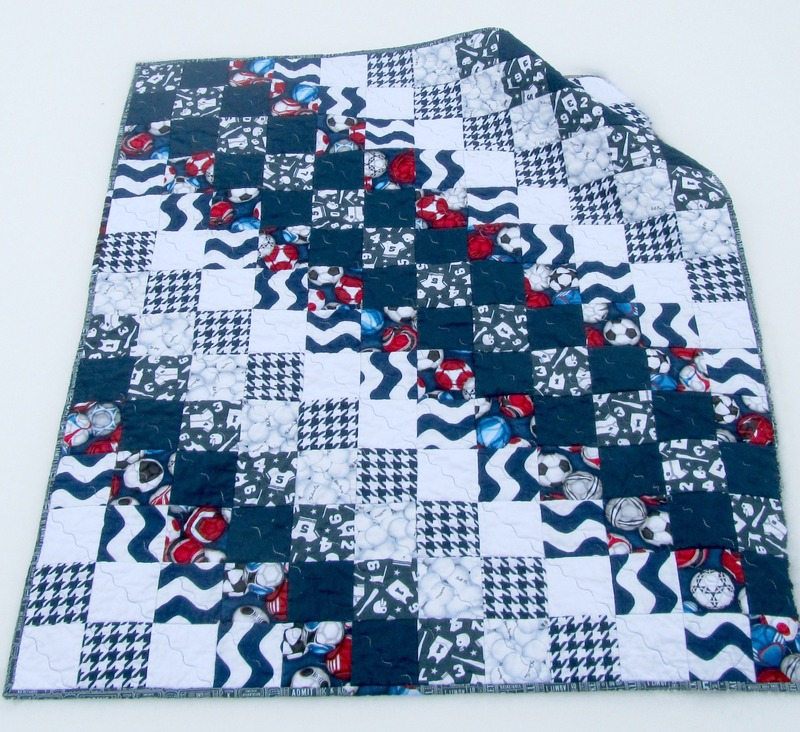 A myriad of troubles disappear when a quilt is washed! This quilt will stay with me. I was checking out bedding in case some of DS’s friends came home with him, and discovered that I didn’t have a spare twin quilt. Now I do. Categories: Finishes | Tags: Evening in the Garden, rail fence, Valerie Root | Permalink. 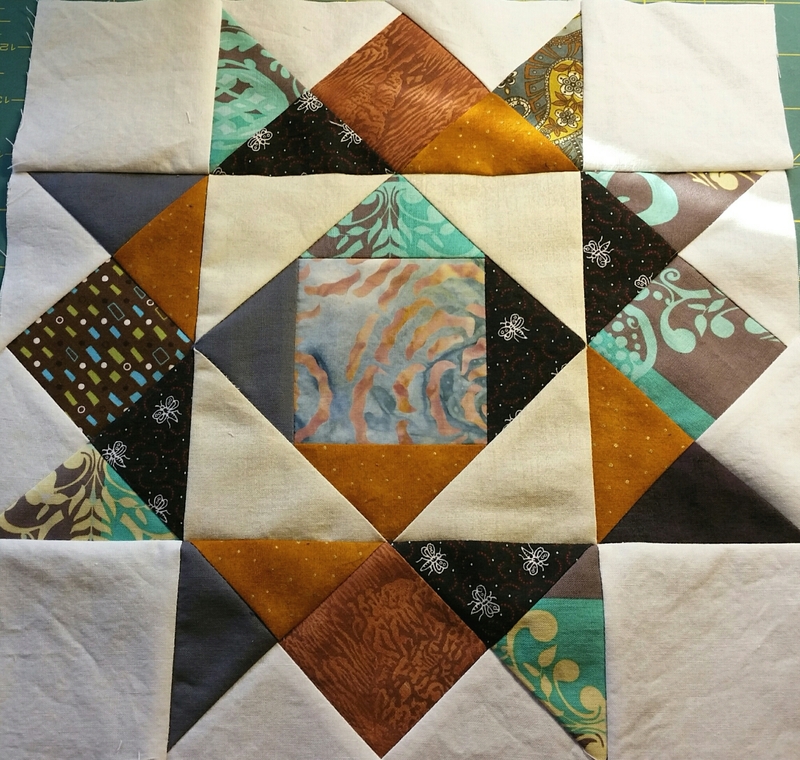 One finish this week for 3.75 yards (this string baby quilt), and no new fabric. 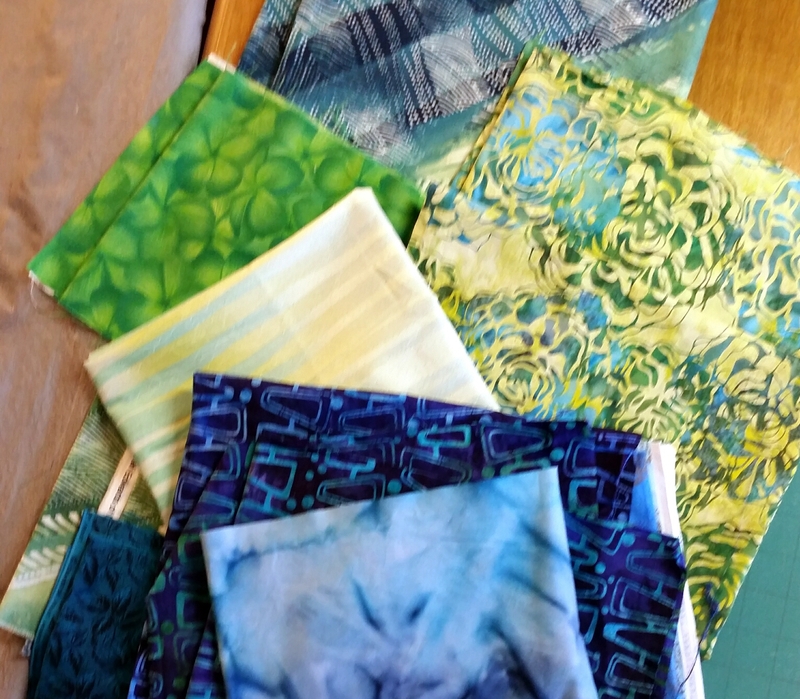 This week I pulled these from my stash for a new twin quilt, and Yuri and I are working away on it. Hope you’re taming your stash. I’m linking up to Judy’s report at Patchwork Times. I’m working away on the two mystery quilts that I’m doing. Here are the blocks for Scrappy Stars Around the Corner. And here are 24 bricks and 8 nine patches for the final round of Bricks, Cobblestones, and Pebbles. Hope you’re making lots of progress on your projects. This week I put this together this little string quilt. Nope, still can’t tell any difference in my string baskets, but it did use a big pile of them. 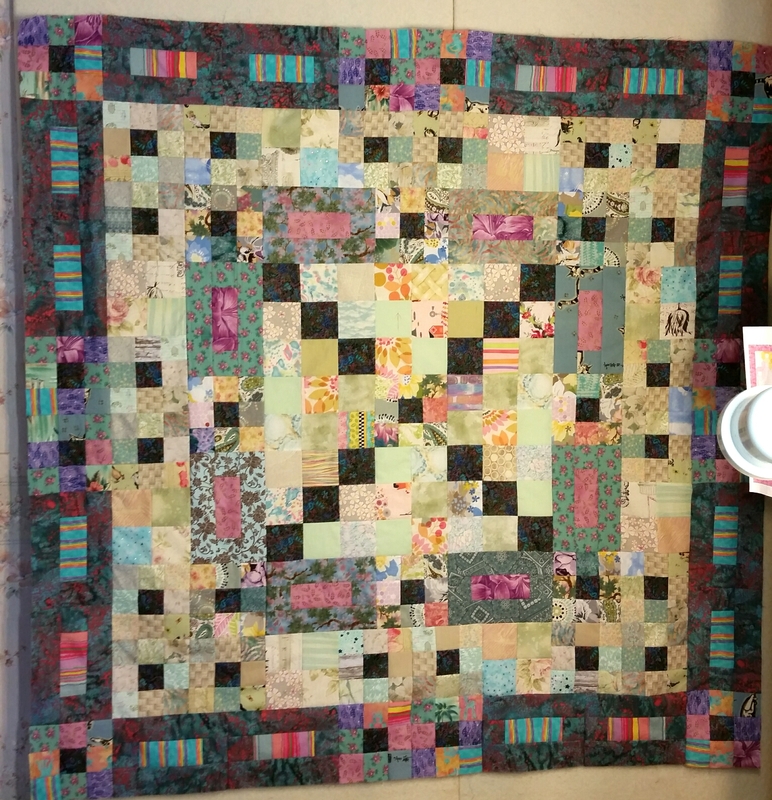 I quilted it with five rows of feathers in white Bottom Line. The back is the last of this alphabet print. I think it’s a sweet little quilt. Categories: Finishes | Tags: chevron, Evening in the Garden, superior thread, Valerie Root, zig zag | Permalink. Lots of sewing this week, lots of WIPs, but only one finish, for 3.5 yards. Okay, a couple more weeks, but I’m getting there! Good luck to you! I’m linking up to Judy’s report at Patchwork Times. Categories: Finishes, Stash | Tags: Evening in the Garden, Valerie Root | Permalink. Snowy and cold here, so I’ve been doing lots of sewing. I got caught up on Gyleen’s mystery quilt yesterday. It’s not my favorite thing, but I like it better since I started trying to control the value. It does use almost all pre-cut scraps, so that’s a positive! 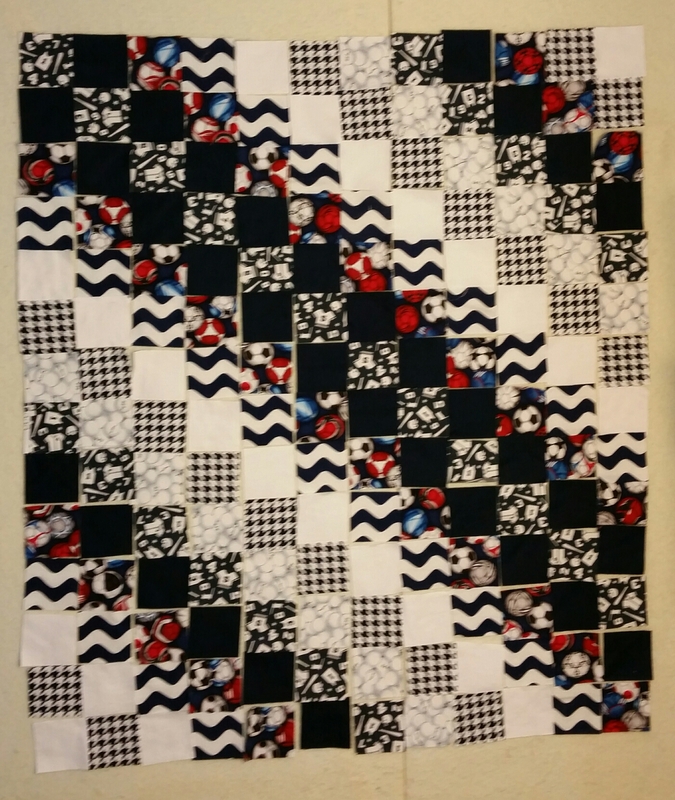 Then I got to work cutting up the scraps (and a little extra fabric) from the Sports baby quilt into 3.5″ squares to make a similar one. I did turn every other wavy patch 90° to break them up. I have it about half sewn together now. While doing all this piecing, I’ve completed thirty-five 16 patch (8″) leaders and enders blocks in blue and brown, so that will be in the que. And Charlotte released Clue 2 in her mystery quilt last night. I’m excited to work on that, as I know that one will look great! Hope you’re all making progress on your projects!